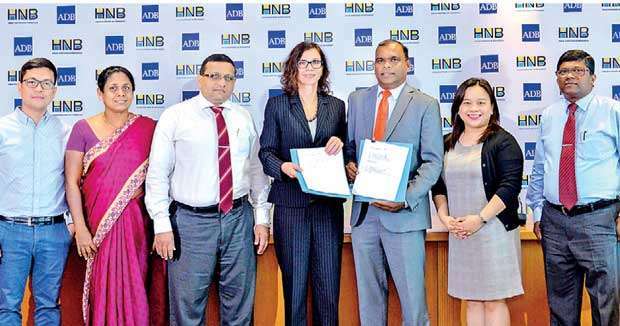 Hatton National Bank PLC (HNB) yesterday announced the signing of a new partnership agreement with the Asian Development Bank (ADB) in order to expand lending and provide guarantees of up to US $ 20 million to support the development of Sri Lanka’s burgeoning microfinance sector. Arranged under ADB’s Microfinance Risk Participation and Guarantee Programme, the agreement was signed by ADB Private Sector Financial Institutions Division Senior Investment Specialist Sabine Spohn and HNB Deputy General Manager SME and Midmarket Jude Fernando at a formal ceremony in Colombo. “HNB is an organisation that has long maintained a trusted and prosperous legacy in the microfinance sector. In our experience, access to finance can often be the crucial factor that determines whether a small-scale entrepreneur is able to achieve his dream of a thriving business. “Today’s agreement between HNB and ADB is therefore a major step forward in our collective mission to support this vital sector. When we combine funding with comprehensive advisory services – all of which are heavily slanted to ensure the maximum benefit to the end customer, we enable fresh economic opportunity in segments that are small but hold tremendous growth potential. Partnerships such as these are therefore vital in creating a sustainable trajectory for our nation’s economy,” Fernando stated. Currently, many microfinance institutions struggle to access funds for growth from the commercial market to meet the demands of clients. Only approximately 17 percent of women have access to formal financial services in Sri Lanka. Through the microfinance programme, ADB and HNB aims to fill market gaps by sharing risks to promote local currency lending to these institutions. This helps mitigate microfinance institutions’ exposure to foreign exchange risks. “We are excited to partner with HNB, an established player in microfinance in Sri Lanka,” said Spohn. Having been among the very first to enter the sector, HNB stands as an internationally recognized pioneer in the microfinance and SME sectors. Through award-winning programmes like HNB ‘Gami Pubuduwa’, the bank has consistently worked to support entrepreneurship across Sri Lanka. Additionally, HNB was also presented with the award for Best Micro Finance Product of the Year in Sri Lanka for the first time at The Asian Banker’s International Excellence in Retail Financial Services Awards Programme 2017 in recognition of its outstanding efforts to leverage technology to drive unparalleled levels of service and customer convenience through digitization and value chain financing for micro and agro-based industries.